Olivia Mehaffey will get her first taste of life inside the ropes at a US Women’s Open after receiving a late call-up to play in this week’s event at Shoal Creek, Alabama (May 31-June 3). “It is a great learning opportunity to get to do this as an amateur,” said the 20-year-old, who is currently ranked 20th in the world. The Banbridge born golfer, who has just completed the second year of her college career at Arizona State, tried to play her way into the tournament via qualifying on May 14th but agonisingly came up one shot short. However, she gratefully accepted the invite she received on Sunday evening and hopped on an early flight Monday morning to Alabama. 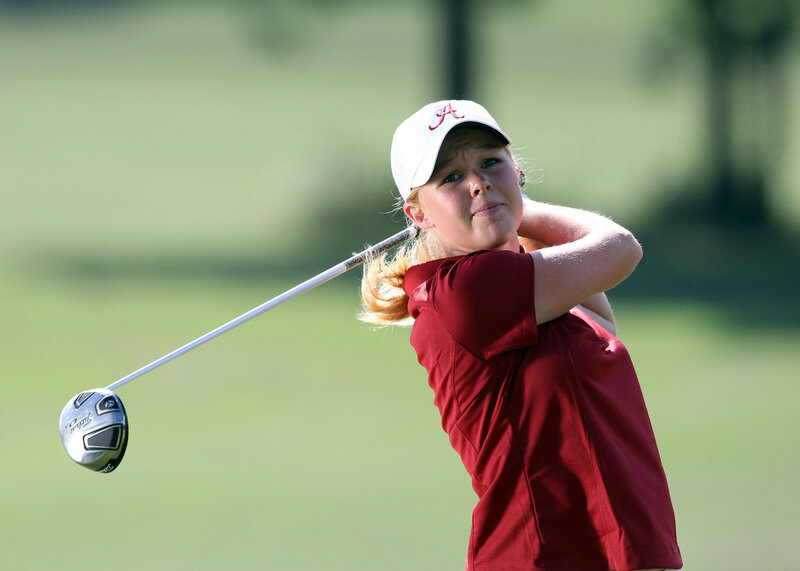 The last Irish golfer to compete in the US Women’s Open was Jordanstown born Stephanie Meadow who remarkably finished in third place, three shots behind the winner Michelle Wie, on her professional debut in 2014. This will not be Olivia’s first experience of major golf, she competed in last year’s Ricoh British Open at Kingsbarns carding rounds of 72/75 to miss the cut. “I’m excited, anytime you get the opportunity to tee it up with the professionals and play majors is amazing,” she added. It’s the start of a very busy summer of golf for Olivia who will go from the US Open to the Curtis Cup in New York (8-11 June) followed by the Palmer Cup at Evian Resort GC (July 6-8). Olivia will be joined in the Curtis Cup team by Lisburn’s Paula Grant as GB&I attempt to retain the title they won at Dun Laoghaire GC two years ago. Leona Maguire won’t be featuring for GB&I in the Curtis Cup this year but Lisburn’s Paula Grant is hoping to nail down a place in the team at this week’s Helen Holm Scottish Women’s Open Championship in Troon (April 20-22). The GB&I side to face the USA at Quaker Rider GC (June 8-10) will be named on April 26 so this is the last chance for Paula to impress the selectors and earn her spot on the team alongside Olivia Mehaffey (RCDL) who will get the nod courtesy of her world ranking. A qualified optometrist, Paula is somehow managing to juggle her work commitments with competing at elite level. Already this year the 24-year-old has played in the South American Amateur Championship in Argentina finishing runner-up in a star-studded field. That was followed by a trip to Portugal for the International Championship and in the worst of the weather, she finished 13th. The weather wasn’t much better during the Spanish Open when she tied seventh in qualifying before losing out in the match play stages to the eventual winner. “I suppose the fact that the girl who beat me went on to win the title was something but it would have been nice to have done better,” said the reigning Irish Strokeplay champion. Last month, Paula was on her travels again as she competed for Europe against Asia Pacific in the Patsy Hankins Trophy at Doha Golf Club. Europe were comprehensively beaten but the Curtis Cup selectors watched on as Paula won her singles match. However, Paula isn’t putting much store by that performance. The Helen Holm Trophy will consist of 54 holes of stroke play contested over three days with 18 holes played on each day. The top 66 players and ties returning the lowest scores after two rounds will qualify for the final round. Twelve Irish players have travelled to Royal Troon to compete at the event – Ciara Casey (Hermitage/MU), Clodagh Walsh (Castlewarden/MU), Emma Forbes (Royal Portrush), Kate Dwyer (Rossmore), Lauren Walsh (Castlewarden), Lucy Simpson (Masserene), Maura Diamond (Royal Portrush), Meadhbh Doyle (Portarlington/MU), Paula Grant (Lisburn), Sara Byrne (Douglas), Shannon Burke (Ballinrobe), Valerie Clancy (Killarney). It was supposed to be the off-season but Olivia Mehaffey spent much of her Christmas break on the practice ground at Royal County Down working on her game. The 18-year-old amateur star from Banbridge, currently ranked number three in the world, has been making some swing changes under the watchful eye of RCD professional, Kevin Whitson. “I’ve been working on compression, starting the ball out a bit lower with a stronger flight,” said Olivia who was back in Northern Ireland after completing her first semester at Arizona State University. The reigning Irish Strokeplay champion, who played a key role in last year’s GB&I Curtis Cup success, is still adapting to life in America but is looking forward to Spring and the main body of the competitive season. “It was nice to get settled in and everything. I really like it over there but there are a lot of things that are different. So the first semester has all been about getting used to those things,” added Olivia who admitted that juggling college studies and golf has been tricky. Arizona compete in the Pac-12 conference and will be facing some of the best college golf teams in the US, including the likes of Stanford and UCLA. It’s top class competition but with the season not finishing until late May, it will likely curtail her outings in domestic events. “It’s impossible to fit everything in. In the past I neglected rest a lot, but I understand now just how important rest is,” added Olivia. “At the moment I’ve four or five events pencilled in, including the European Individual Championship, the British Amateur and the British Open. I also hope to be selected for the Vagliano Trophy and I’m also going to try and qualify for the US Open. “I really don’t want to overdo it. If I play the full college season, then come home and play and then turn around and head back to college in September for more golf I’ll not have had any meaningful rest. Leona Maguire’s decision to turn her back on professional golf – at least in the short term – has been broadly welcomed with Paul McGinley and Catriona Matthew amongst the vocal supporters on social media. The current world number one ranked amateur had cruised through LPGA Qualifying School Stage II in October but rather than go on to Qualifying Stage III in Florida next week, Leona has decided to remain an amateur and complete her studies at Duke University. In a statement, the 21-year-old from Co Cavan said; “Upon considerable deliberation, I have decided to withdraw from stage III of LPGA Q-school and not pursue LPGA membership for 2017. “This is not a decision that I have taken lightly but one that I feel is best for me in the pursuit of my long-term aspirations. Tough and good decision @leona_maguire to remain at College – you'll be even smarter when you do turn pro !! In June, Leona played a key role in GB&I’s Curtis Cup victory against the USA at Dun Laoghaire GC and more recently, she helped Ireland capture an historic bronze medal at the World Amateur Team Championships alongside Olivia Mehaffey and Annabel Wilson. She added;“My dream is and always has been to compete alongside the world’s best on the LPGA and this remains resolutely unchanged. The summer also saw Leona represent Ireland at the Olympics where she finished tied for 21st and claim the Smyth Salver Trophy after finishing the RICOH Women’s British Open as the top ranked amateur. Leona is studying Psychology, Business and Accounting at Duke. Leona Maguire was presented with the 2016 Mark H McCormack Medal by current world number one and three-time winnner of the medal Lydia Ko ahead of the women’s Olympic Golf event at Rio 2016 today. Leona Maguire has won the Mark H McCormack Medal for the second consecutive year as the leading women’s player in the 2016 World Amateur Golf Ranking. Maguire will compete for Ireland in the Rio 2016 Olympic Games this week alongside Stephanie Meadow and speaking from Brazil she said she was delighted to win the prestigious medal once again. “It is a huge honour for me to win the Mark H McCormack medal again this year,” said Maguire. “I am incredibly grateful to my family, my coach Shane O’Grady, the Irish Ladies Golf Union and the Confederation of Golf in Ireland and everyone at Duke University. Without their support and help this would not be possible. 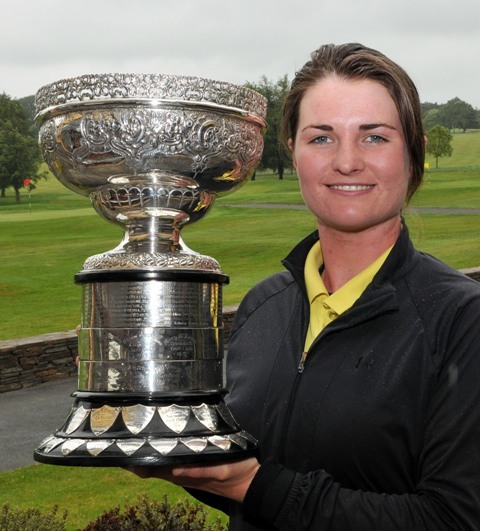 The Cavan born golfer played a significant role in Great Britain & Ireland’s Curtis Cup win against the USA in June, contributing four points to the 11½-8½ victory. Last month, she won the Smyth Salver after finishing as the leading amateur at the Ricoh Women’s British Open at Woburn, in a tie for 25th place, and also played in the U.S. Women’s Open at CordeValle. Following the Olympic Games, in the autumn, Maguire will take part in Qualifying School for the LPGA Tour. As long as she remains an amateur she will receive an exemption into the Ricoh Women’s British Open and the U.S. Women’s Open in 2017. Right now, her focus is on making a medal bid for Ireland. “We’ve been to a bunch of events – hockey and swimming and saw Michael Phelps. So it’s just been really fun.” she said. Former professional, Danielle McVeigh, will make a return to inter-club action on Sunday when she plays for Royal County Down Ladies in the Ulster Senior Cup qualifiers at Clandeboye GC. Danielle, who represented GB&I in the 2010 Curtis Cup, turned professional in 2011 but two years of battling without a breakthrough eventually took its toll and she called it a day at the end of 2013. The 26-year-old put her clubs away, found work with Dublin based software firm Qualtrics and discovered that there was more to life than golf. Now, with her enthusiasm renewed and her amateur status reinstated – she has been given a +2 handicap – Danielle is back playing and will be getting her first taste of match-play golf in almost six years when she lines out for RCD at Clandeboye on Sunday. “RCD Ladies did O.K during the period I was playing for them,” said Danielle. “We won Ulster a few times but never managed to go on and win an All-Ireland. Olivia’s recent hat trick of success in Ireland, Scotland and Wales mirrors victories achieved by Danielle in her last year as an amateur in 2011. “I won the Helen Holm and the Welsh Strokeplay back-to-back just like Olivia,” added Danielle. “I’m also planning to play in the Irish Stroke Play in a couple of weeks. To be honest, I’m only playing in places where I like to play golf. As professional debuts go, Stephanie Meadow’s decision to make her bow at Pinehurst in the US Women’s Open will be hard to top. The 22-year-old, originally from Jordanstown, takes her first steps this week as a fully paid up member of the pro ranks at the iconic venue in North Carolina. After a stellar amateur career, one that included two Curtis Cup appearances, Meadow feels the ‘time is right’. “I have completed my degree at the University of Alabama and it’s the perfect moment to come here and make this my first event,” said Meadow who moved with her entire family to the United States as a 14-year-old. When the Meadow family made the decision to emigrate to America some eight years ago it was probably considered something of a risky move but, rather like Graeme McDowell, Stephanie flourished in the Collegiate system, winning numerous awards. A member of Royal Portrush Ladies, Stephanie has already played in a US Open as an amateur, at the 2012 staging at Blackwolf Run in Kohler, Wisconsin and is in something of a hurry to get going as a professional. “I am just excited to be a professional, I have dreamed about it for so long,” she added. “To finally get it organised, to wake up and be able to say, ‘I am a professional’, was great. “As regards the US Open, at the end of the day, it is still golf course, a ball and a hole. You could say there is more pressure now that I am a professional but I have worked for this moment for a long time. Meadow had indicated that the Curtis Cup [at the start of June] would be her last event as an amateur but the official announcement was delayed by on-going administrative efforts to get her visa extended. The issue has had a knock-on effect on her ability to make concrete plans involving signing contracts etc, but she is hopeful the matter will be wrapped up in a couple of weeks. As it is, the planning process for the weeks after the US Open continues with Stephanie looking to sort out a schedule of events. “It is very flexible at the minute,” she added. “I will try and Monday qualify as often as I can for LPGA events and I also have an exemption into Symetra Tour event in August. “I have written to a number of events in the hope of getting an invite. A lot of them haven’t made any decisions yet so it is really a case of waiting to see. “I don’t think I will be playing much in Europe. I will focus on America and go to Q-School in the States. IF you’re looking for a taste of links golf ‘Scottish style’ you shouldn’t automatically head for St Andrews. Scotland has much, much more to offer and certainly, from a Northern Ireland perspective, you don’t have to travel far to savour the experience. The West coast of Scotland often gets overlooked but South and North Ayrshire has a wonderful array of courses all within a short driving distance from the port of Troon. Pack the car in the morning, hop on the P&O ferry at Larne and you can be playing at historic venues like Glasgow Gailes, Barassie or even the 2004 Open venue, Royal Troon. On a recent visit I tackled Western Gailes and Dundonald Links, two courses separated by the Ayrshire Coast railway line and over 100 years of history. Western Gailes was founded in 1897 and retains an air of tradition while Dundonald Links, designed by Kyle Phillips, only opened for business in 2003. Western Gailes is a classic old style links very much in the mould of Kirkistown Castle, or Castlerock. 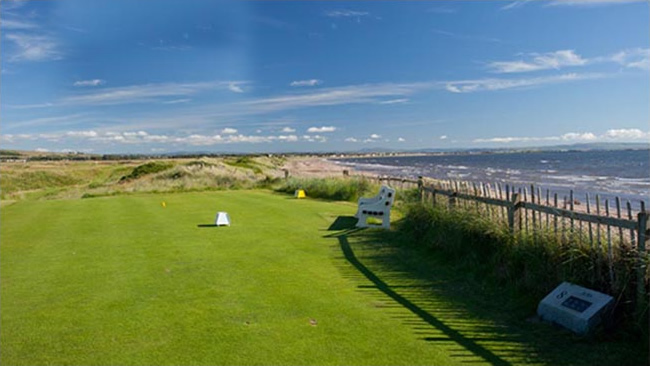 The course is squeezed into the land between the sea and the railway line but unlike many links courses where the sea is often blocked from view, at Western Gailes it is a constant presence, particularly on the stretch of holes from the fifth to the 13th. Played off the tips the course measures just over 7000 yards, long enough to make it a challenge for some of the world’s best. Western Gailes has played host to the Curtis Cup and the Home Internationals. It is also a regular venue for Open Championship qualifying. Thankfully, on our visit we played off the ‘visitors’ tees, which proved challenging enough particularly when facing into what my caddy helpfully referred to as a ‘light breeze’. Coping with the wind and rain is, of course, all part of any links golf experience and Western Gailes, devoid of the huge dunes that frame the likes of Royal Portrush and Royal County Down, is more exposed than most to the elements sweeping in off the Fifth of Clyde. The opening hole ‘Station’ offers a gentle start before the real challenge commences. The par four second ‘Railway’ plays to a small bowl-shaped green, hidden from view by the rolling mounds and hollows. The par five sixth, ‘Lappock; plays along the water and requires two good shots to get into position to attack a large green which is tucked away almost at right angles to the fairway. There is no let up on the back nine. The 13th ‘Barassie’ is the second of the three ‘short’ holes on the course and offers some respite in terms of length, but even it is surrounded by bunkers, gorse and heather. The closing holes all play alongside the railway line bringing ‘Out of Bounds’ into the equation. The 16th, ‘Camp’ appears innocent standing on the tee but a hidden burn just short of the green makes for a treacherous approach. At the 17th, ‘Ridge’ the fairway narrows at 270 yards off the tee and the second shot is blind over a gorse mound to a narrow green. There is no let up at 18, which dog legs gently left. Golfers must play over one more burn and avoid the final bunkers to find the home green. Western Gailes is a fantastic challenge and I certainly benefited from having a caddy who knew ‘where not to hit it’. On a course with so many hidden dips and hollows, that local knowledge was invaluable. If you get the chance to play it, and it really is worth a visit, investing in a caddy might also be a wise investment. Thankfully, when you’ve been battered by the elements and the course, the clubhouse is warm and welcoming. You won’t find any stuffiness at Western Gailes. Instead you’ll enjoy superb hospitality in a relaxed atmosphere which only adds to the entire experience. During our two-day excursion we stayed at the excellent four-star Menzies Hotel near Irvine, a mere five-minute drive from both courses. It’s a modern ‘golfer friendly’ hotel with comfortable, bedrooms, a contemporary brassiere restaurant, a stylish cocktail bar and a spacious lounge. More importantly, it is ideally located to make it is the perfect base for a golfing break. 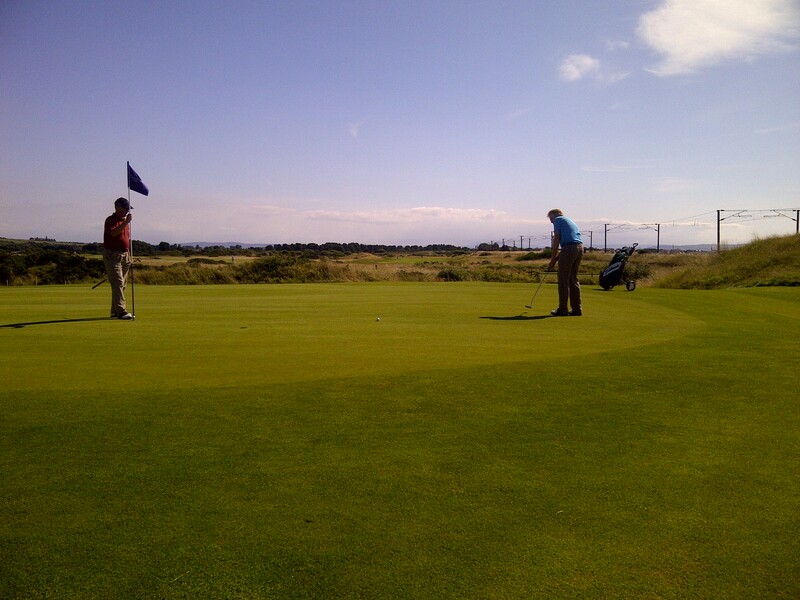 So refreshed and ready for action we arrived at Dundonald Links for the second round of our visit to Ayrshire. 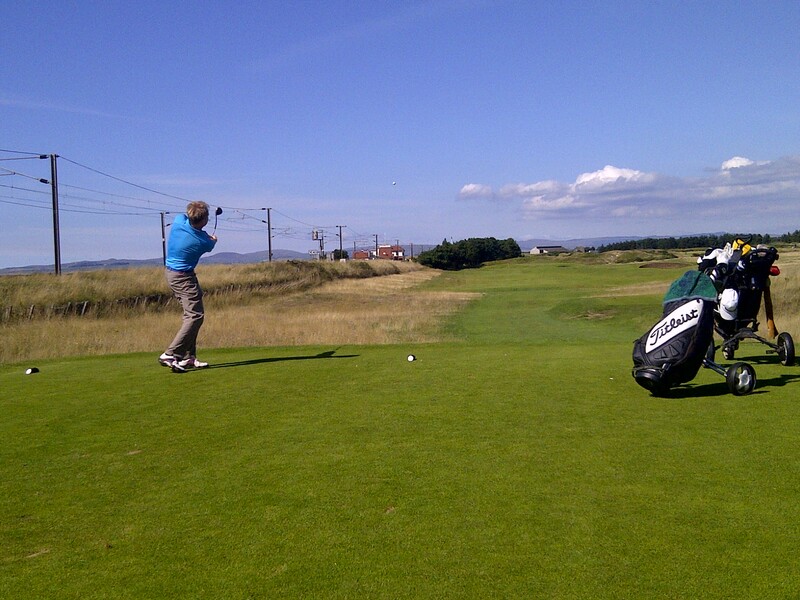 Dundonald Links has been getting rave reviews since opening for business a decade ago and on a bright sunny day (the sun always shines in Scotland) it was a real pleasure to play. Understandably, this modern links venue is a much different to Western Gailes. For a start, there’s a fine driving range and practice facilities to get you ready for your round. On the course you won’t find any small bowl greens tucked away out of sight although you might find one or two sneaky pot bunkers. The green complexes are large and many of them are raised above the level of the fairway which makes running a shot in along the ground damn near impossible. Dundonald is owned by the Loch Lomond private club and was acquired to give its members a taste of winter golf. Since opening for play, this 7100 yard par 72 course has played host to pre-qualifying for the European Tour and the Senior British Open Championship. The first offers a relatively benign opening tee shot to a wide fairway but the second shot to a narrow, two tiered green better be on target or you could be struggling for a bogey. The difficulty ramps up at the 530 yard par-five third. The tee shot is protected by a burn, all the way down the right hand side, which then crosses the fairway creating a challenge on your second or lay up shot. The enormous three-tiered green is protected short and back by bunkers and is a prime candidate for the dreaded ‘three-putt’. The front nine closes with a really tricky par four. Two steep faced fairway bunkers stare at you from the tee and if you are lucky to clear them, the viciously sloping green is protected by a burn and two more green side bunkers. It’s stroke index two for a reason – if you manage a par take it and run to the 10th. The back nine gets underway with a another difficult par four which plays towards the ever present backdrop of the Caledonian Paper Mill and is followed by a wicked, short (120 yards) par three that requires a pitch over marsh to a raised green guarded by three bunkers and a nasty pot bunker, 15 yards over the back. There’s no other option here, you simply must hit the green to even stand a chance of walking away with a par. The round finishes with another testing par five measuring 540 yards. Generous off the tee, this hole gently dog legs to the right and requires more strategy than brawn. The key is getting into position to attack a narrow green guarded by yet another burn, but to do so you will have to avoid the fairway bunkers. Depending on where you place your second shot a four, five, or six might be a satisfactory finishing score. I found the front nine at Dundonald Links the easier of the two to score on, but the back nine is certainly the more picturesque, with the 16th a wonderful creation. The club prides itself on being ‘visitor’ friendly, with tee times available at the weekend. The clubhouse is low-key but more than adequate while the service and attention to detail shown by the staff was simply first class and added to a really enjoyable experience. Ayrshire may not have the historical appeal of St Andrews, but on the basis of my visit, it is very difficult to find fault with the golf on offer. This is prime golfing country and there’s enough variety in terms of price to suit almost everyone’s pocket.